If you have a cat, you need to make sure that they have everything they need to be healthy and happy, including something of their own to scratch on, such as a scratching post. Scratching posts are one of the best cat scratch deterrent accessory items you can have. If you don’t give them a scratching post, chances are they are going to end up destroying the furniture, curtains, and a whole lot more in your home, because cats need to scratch and claw, for a variety of reasons. Invest in some quality cat furniture like a cat scratching post for your feline. But, with so many different types of cat scratchers available, which is going to be the best for your cat or kitty? Today we are going to take a look at five of our favorite cat scr​atchers, their best features, and the pros and cons of each. The PetFusion 3-Sided Vertical Cat Scratcher and Post is a scratcher, a play area, a sleeping area, and a whole lot more. It can be turned six ways for a variety of uses for your cat, assuring that they are never going to get bored with it. Your cat can use this for scratching, stretching, sleeping, and playing, and they can stretch at numerous angles, so all of their muscles get stretched out. This is not a huge cat scratcher, so it is ideal for small spaces. It measures 18 X 10.5 X 16 inches. It may not be a large scratcher, but it is huge when you think about all of the different ways that it can be used. The PetFusion 3-Sided Vertical Cat Scratcher and Post is made from durable cardboard, and each piece is glued together separately for durability. It comes pre-assembled, and all materials are tested to ensure that they comply with international standards for pet products. This cat scratcher is designed so that it can be used in many different ways. It allows cats to get a full horizontal stretch while scratching, and the cubby hole is great for play and exploration, as well as a good place for a nap. If you are not one hundred percent satisfied with this product, or if there are any manufacturer defects, you can return it for a replacement or full refund. There is a six-month warranty on all PetFusion products. This cat scratcher can be purchased for less than $40 and is of better quality than other scratchers made with similar materials. It will last for several months, even up to a year, so you are getting a lot of value for the money. This product is made from environment-friendly, recycled materials. The cardboard is 100 % recycled, and each piece is glued together using a non-toxic glue that is food-based, made from starch (similar to a flour and water paste). The shape of this scratcher is different from most, but it still allows for a full horizontal stretch. It isn’t a tall cat scratcher, but it does let your cat scratch from a variety of angles, and there are many opportunities for play. One of the biggest problems with this cat scratcher is that it is too easy for cats to shred. This means that you are going to have a lot of mess every time your cat scratches at it. Be sure to keep a broom or vacuum nearby so you can keep the area around the scratcher tidy. The Midwest Feline Nuvo Grand Forte scratching post and cat tree is the answer to your prayers if you have a cat that loves to scratch on furniture. Now, they can have their own piece of furniture to scratch as much as they want, and you aren’t going to have to spend a lot of money on it. 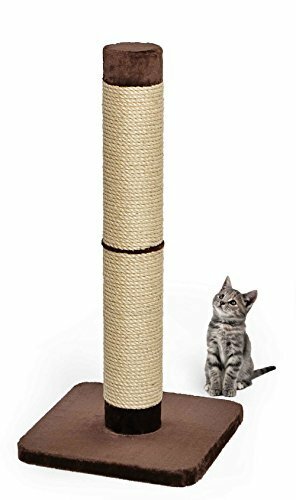 This is a durable scratching post that is tall enough for any cat to get a full vertical stretch, no matter how large the cat is. Let’s take a look at a few of the best features of this cat scratching post. This cat scratching post is easy to assemble, so you can have it ready to use in just a few minutes. The pole easily attaches to the base, and everything you need for assembly, including the tools, are all in the box. The strong supports are wrapped in sisal, giving your cat a sturdy area to claw and scratch at. The sisal makes this a very strong cat scratcher that is going to withstand many months of abuse by even the most destructive of cats. This is a very sturdy unit. The base is quite heavy, which is going to ensure that the scratcher won’t topple over while kitty is busy scratching and stretching, even when they are reaching up to the highest levels. This cat scratcher comes with a one-year limited warranty protecting you against any manufacturer defects. If you have any questions or concerns about this scratcher, contact the award-winning MidWest customer service team for fast and excellent support. This scratcher may not have an area that is specifically designed for sleeping, but that doesn’t mean that you won’t catch kitty snoozing on the base. This is because it is covered with a soft, furry fabric that cats love to get comfy on. Most cat scratching posts are no more than two or three feet tall, which isn’t always tall enough for very large cats. This post is different than most because it is well over four feet in height. Because this is a tall scratching post, it is going to help satisfy your cat’s need to climb. This means that your furniture and curtains are going to be safe because they have something of their own they can climb on. While sisal is ideal for cat scratching posts, it is better to have sisal fabric rather than sisal rope, which is what this scratcher has. This is because the fabric is a lot stronger and more durable than the rope, and it can take more wear and tear. 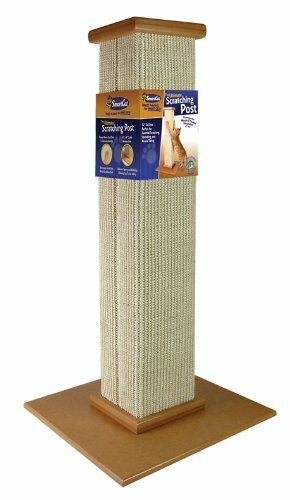 The 2-in-1 Sisal Cat Scratching Post with Interactive Cat Toy is not only a great way for cats to keep their claws trim and sharp, but also a place where they can play and even nap. This is a cat scratcher that is going to keep them entertained for hours, even when you are not at home to play with them. This cat scratcher is very unique in design. You can take it apart, so it is portable, making it ideal to take with along if you travel with your cats. It is made with eco-friendly wood that is treated with natural, food-based oils. 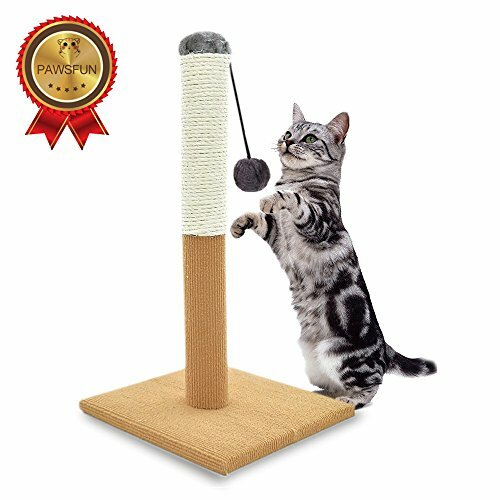 The 2-in-1 Sisal Cat Scratching Post with Interactive Cat Toy comes with a risk-free, 100% guarantee. If you have any questions or concerns regarding this item, simply contact customer service and they will answer all of your questions or arrange for a replacement or refund. This is a cat scratcher that has multiple uses. Not only can your cat do all of the scratching they like, but they can also get a full vertical stretch. They can also play with the ball that hangs from the top of the unit, as well as with the balls that roll around in the base of the unit. There isn’t a lot involved in assembling this cat scratching post. All you have to do is screw the post to the base, and it is ready to use. The hardware is included, so you just need to make sure you have a screwdriver on hand. This is not a large cat scratcher, so you can use it in just about any room, and it is even small enough to fit into an RV or motel room. But, even though it is small, it provides plenty of scratching area for your cat. Other similar cat scratchers can cost upwards of $50. You can get this one for less than $30, and it is going to last for at least a year. To give you even more value, you won’t have to spend money replacing furniture and curtains. Not only is this a durable cat scratcher, but it is also extremely sturdy. The base is made from heavy wood, so it is going to keep the unit in place. It isn’t going to topple over while kitty is stretching out against it. The one thing we don’t like about this cat scratcher is the fact that it doesn’t have any traction. If it is on a smooth surface floor, you can expect it to slide around. Gluing some rubber nubs on the bottom will alleviate this problem. 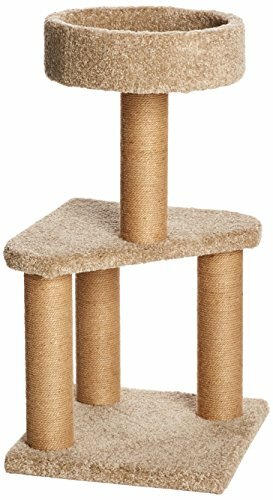 The AmazonBasics Cat Activity Tree with Scratching Posts is more than just a scratching post. It is also a play area, and a place where they can hide or nap. This is an all-in-one activity center for cats that is going to help keep your cat from destroying your furniture and drapes, and it isn’t going to cost you a lot of money. Many different materials are used to make this cat scratcher, so your cat has a variety of surfaces to scratch. Materials used include jute, cardboard, carpeting, and MDF, and the stand is made from compressed wood. All of the surfaces are carpeted for kitty comfort. Some cat scratchers only have one post. This one has three, so your cat has options and isn’t likely going to become bored and move on to the furniture. The posts are covered in jute, which is going to stand up to a lot of abuse from your cat. The top section is ideal for lounging and has a curved-top rim so your cat can feel nice and snug. There is plenty of space for your cat to get comfortable, making this an ideal cat bed as well as a scratcher. This unit is easy to put together. All of the hardware and tools needed for the assembly are included, so you don’t have to go out and buy any special tools or screws. This scratcher has a screw-together assembly, so it is ready to use in a couple of minutes. This is a sturdy unit that isn’t going to topple over, thanks to the heavy base and the way it is designed. 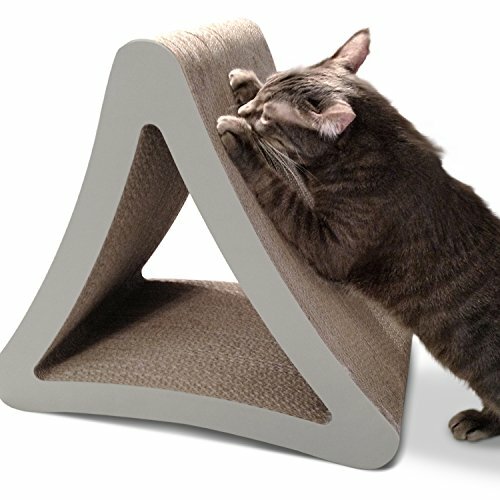 Your cat can safely jump on this scratcher, play on it, scratch at it, etc., and then when they get tired out, they can use the top tier for sleeping. Cats need to be able to stretch vertically, and your cat can do just that because this unit is plenty tall enough. It is three-tiered, so it has lots of space for your cat to jump, play, scratch, and more. This unit may have plenty of room for playing and sleeping, but it isn’t going to stand out like a sore thumb. It is small in size, so it isn’t going to take up a lot of space, making it ideal for apartments. Due to packaging errors, your order may arrive with some parts missing. If this is the case, don’t hesitate to contact customer service to have replacement parts sent out. Parts that tend to go missing are the hardware and Allen wrench. The Pioneer Pet SmartCat Ultimate Scratching Post is tall enough for most cats to be able to get a full vertical stretch while scratching, which their muscles need. It is 32 inches in height, so it is great for even larger cats to scratch at. The base is heavy and sturdy, which means that even if your cat jumps up and pushes at the top of the unit, it isn’t going to topple over. Let’s take a look at some of our favorite features on this cat scratching post. You can easily put this unit together in just a few minutes. The base and post simply screw together, using two screws that are included in the box. Screw the pieces together, and watch your cat enjoy hours of scratching, stretching, and fun. There are many different fabrics that can be used to cover scratching posts, but one of the best choices is sisal, because it is so durable, and safer than carpet, which can snag and tear the claws. Most cat scratching posts are tubular in shape, which makes it difficult for a cat to be able to grab onto it with both paws. The Pioneer Pet SmartCat Ultimate Scratching Post is square, so it is easy for them to claw from both sides. This is an attractive cat scratcher that will work in any room in your home. It is small, and can easily be hidden behind furniture, such as a piece that your cat likes to scratch (the post will give them an option so they will scratch it instead of the furniture). This is a cat scratching post that is made from very durable materials, so it is going to last for several months. Some cat owners say that their cats are still using this scratcher a year after they purchased it. This is an inexpensive cat scratcher, costing a lot less than comparable models made from similar materials. You can get this cat scratching post online for less than $40, and it is also going to help you save money by protecting your furniture. You would be surprised at how long cats can get when they stretch out, which is why they need a scratcher that is tall enough to let them get a full vertical stretch. This unit is a lot taller than other similar models, allowing for plenty of stretching. The top of this cat scratching post is slippery, so it is not ideal for cats that like to jump onto the surface, which is most cats. You may want to cover this with fabric so your cat won’t slide right off. Hopefully, you now have a better idea of your various options and the price range for cat scratching posts. Any of the products we have talked about today are going to be great for your cat, even if you live in a small space. They all provide plenty of scratching area, and some even come with toys and a place to sleep or hide. Check out our article with useful tips to train a kitten to use scratching post. Send us your video of your cat and scratching post, we love to hear from our readers! We have many more reviews and helpful advice to assist you in making an informed decision for quality cat furniture and accessories for your feline. Perhaps your searching to find out what is the best material for cat scratching post? Read through the many reviews and advice articles we have compiled for you, our readers right here.